What if you could create your own personal bank, without putting up the required reserves and the government regulations. What would it look like? What features would it have? • Tax-Free accumulation on my earnings. • Tax-Free income when needed. • It to be self-fulfilling, meaning that should I not be in the picture it would still produce immediate and perpetual Tax-Free cash for my family. • It to be funded should I become disabled. • It to earn interest without the worry of uncontrollable market risks. Steady, consistent, year after year “upside only” accumulation, somewhere between 5% and 8%. No home runs, just single after single, each and every year. • It to make certain that any gains I earned would be locked away and not subject to market downturns. • It to allow me to borrow money personally without interest, without a payment schedule (I would want repayment optional), and without effecting my credit score. • It to allow me to use my loan for whatever I want, without qualification or time delays. With no one telling me NO. I would want no hassle loans to buy a car, a boat, a down payment on a home, real estate opportunities, business opportunities, education for my children and grandchildren, medical expenses, emergencies and retirement income. • It to allow me to lend money to my family members at the preferred rates I designate. • It to allow me to forgive loans to family members if I want. • It to pass to my spouse, children, grandchildren or my favorite charity without taxation on the gains and without the expense of probate. • It to be creditor proof, protected from frivolous law suits. • It not to have required distributions. If a withdrawal is taken I want it to be my decision and not the government. I don’t want them to ever tell me when, how much or how often. • It to be customer friendly bank, with NO debt collectors calling. • It to be backed by the strongest financial companies in the world. Stable companies that are over 150 years old. 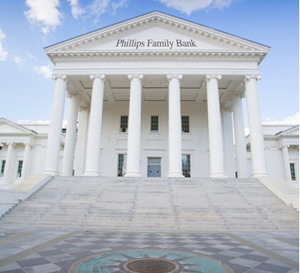 • It to be called the Phillips Family Bank. • And most important I want it to be safe from scammers like Bernie Madoff and other Ponzi criminals. A total of 17 qualities that I would want for my personal Phillips Family Bank. A pipe dream you may say? Not so fast. The bank that I just described actually already exists. In fact, it has existed in some form or another for over 250 years. It has been so critical to the American economy that Walt Disney created one and used it to initially fund Disneyland. Ray Kroc borrowed money from his Family Bank to pay McDonald’s employees when no other bank would lend him a dime. The list of savvy affluent Americans that have their own Family Bank reads like a Who’s Who in American business: JC Penney, Warren Buffet, Ben Bernanke, Doris Christopher (Pampered Chef), Ed Slott (IRA guru and CPA), the list goes on and on. I know what you are asking, so if The Family Bank has existed for centuries, why haven’t I heard of it? Well you have, it has been difficult to see in the light because it has been disfigured by regular banks, brokerage firms and naysayers that don’t know the truth. So what is this Family Bank Strategy? Permanent Cash Value Life Insurance. Ok, before you turn me off, you need to understand that the stars have aligned to make Permanent Cash Value Life Insurance the most efficient “safe money” option in today’s economy, bar none. You can learn more about The Family Bank Strategy in my book click here to order today. You will learn the truth about each factor and how permanent cash value life insurance can be used to create your own personally Family Bank. Since the introduction of income tax and the Internal Revenue Code in 1913 as a result of the 16th amendment, life insurance has been afforded preferential tax treatment. As long as the rules are followed and we don’t get too greedy, the TAX FREE status of permanent life insurance will remain. If structured correctly it can be your own personal Family Bank with part of your premium paying for the cost of insurance, or the mortality expense, and the excess, up to the IRS limit accumulates TAX FREE and is available for family loans or personal income, TAX FREE. Call us at 1-888-892-1102 if you have any questions.